Adding an over-the-counter microwave to your stove saves counter space and brings new cooking technology, such as convection heating, to your kitchen. The height you choose to install your microwave over the cooking or counter surface depends on several factors: the height of the individuals using the microwave, the strength of the oven below and the height of the surrounding cupboards. Over-the-counter microwaves free up counter space for other appliances. When selecting a height for your new oven, consider the height of the individuals accessing the microwave. Shorter people or those who use a wheelchair may have difficulty reaching the door if it's set too high. The height of the surrounding cupboards should also be a factor in your decision. Setting the microwave level with the surrounding woodwork gives the kitchen a tidy look. Ovens rated over 60,000 BTUs may not be suitable for over-the-counter microwaves. Manufacturers recommend a minimum of 30 inches between the top of the microwave and the cooking surface, leaving approximately 15 inches between the bottom of the appliance and the stove, depending on the exact size of the microwave. 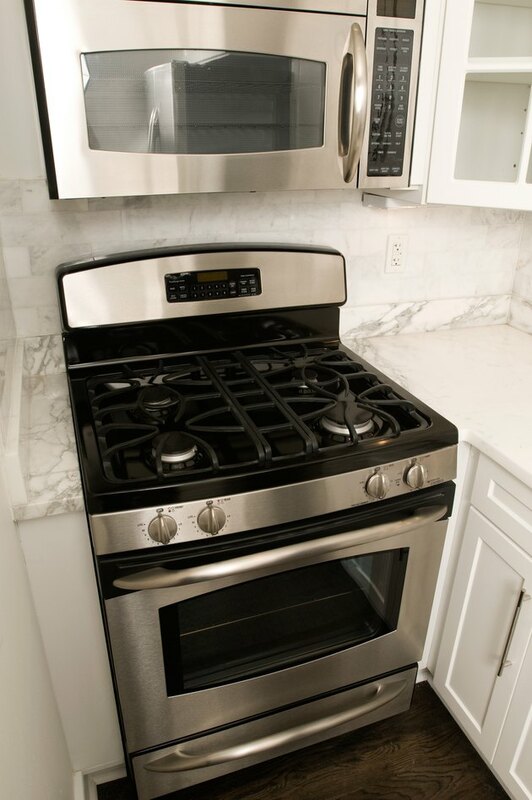 You might want to place the appliance higher if you require extra vertical space above the cooking surface. Over-the-counter microwaves often incorporate a ventilation system for clearing steam and odors from the cooking surface below. There needs to be easy access to an electrical outlet as well as a wall suitable for drilling, if necessary, to mount the microwave. Ovens are best placed against an exterior wall for optimal ventilation. Can I Mount a Pendant Light Over a Stove?